The revelation of the call comes as many Republicans have begun criticizing Trump for his ties to Democrats, including past financial donations to the Clintons and their charitable foundation. Trump donated to Hillary Clinton’s Senate campaigns as well as to the Clinton Foundation. Trump took the call from his office in Trump Tower in New York, according to the four allies, who requested anonymity because they are not authorized to speak publicly. The call came as Trump was making a final decision about whether to run, and he was candid about his political ambitions and his potential interest in seeking the White House during the talk, these allies said. The 42nd president listened intently and then analyzed Trump’s prospects and his desire to rouse the GOP base, the Trump allies said. The tone of the call was informal, and Clinton never urged Trump to run, the four people said. Rather, they said, Clinton sounded curious about Trump’s moves toward a presidential bid and told Trump that he was striking a chord with frustrated conservatives and was a rising force on the right. One person with knowledge of Clinton’s end of the call said the former president was upbeat and encouraging during the conversation, which occurred as Trump was speaking out about GOP politics and his prescriptions for the nation. Clinton aides declined to speak on the record about the call, saying the conversation was personal. At the time, Trump was touting a “foolproof” but undisclosed plan to defeat Islamic State terrorists and ramping up his presence on the airwaves, including interviews where he was asked about his donations to the Clinton Foundation. He entered the race June 16. Hope Hicks, a spokeswoman for the Trump campaign, declined to comment. The campaign of Hillary Clinton did not immediately respond to a request for comment. Trump is a longtime acquaintance of the Clintons, both of whom attended the businessman’s third wedding in 2005. Since Trump entered the presidential race, however, he and Hillary Clinton have increasingly traded barbs. She has condemned Trump’s racially charged remarks about Mexican immigrants and tut-tutted about his remark that Sen. John McCain (R-Ariz.) is not a war hero. In June, she criticized Trump, without using his name, over his references to Mexican immigrants as rapists and criminals during his June campaign launch speech. “A recent entry into the Republican presidential campaign said some very inflammatory things about Mexicans. Everybody should stand up and say that’s not acceptable,” Clinton said in an interview with Nevada political reporter Jon Ralston. Clinton demurred when asked to specify to whom she was referring. Instead, she has frequently sought to tie Trump’s views to the broader GOP field. That’s a long way from the cordial, even cozy, relationship between the two when Clinton was a U.S. senator from New York and Trump was a constituent and supporter. 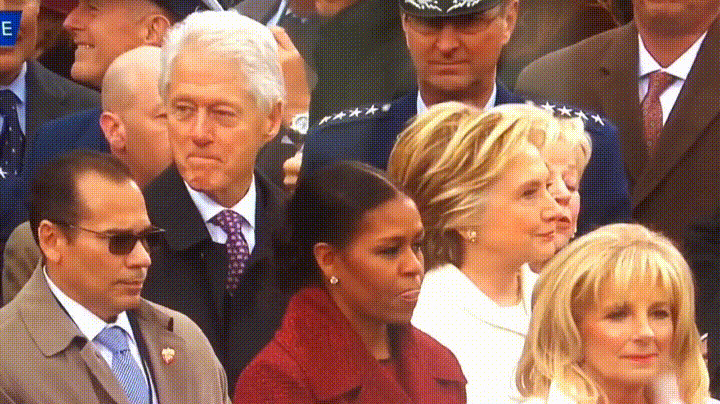 At Trump’s 2005 wedding, Hillary Clinton sat in the front row for the ceremony, and Bill Clinton joined her for festivities later. The Clintons were photographed laughing chummily with Trump and new wife Melania Knauss at the reception, with Bill Clinton clasping Trump’s shoulder. The Clinton campaign has been barely able to contain its glee at having Mr. Trump as a foil to use against the entire Republican field. While most political observers don’t believe that Mr. Trump can capture the Republican nomination, his candidacy has proven strikingly resilient since his campaign kickoff, with each new controversy only appearing to galvanize his supporters. The newly-released (09/09/2016) photos underscore just how chummy GOP presidential nominee Donald Trump once was with the president and his wife Hillary. A copy of the book, Full Disclosure, was obtained by the Guardian. In it, Story Daniels describes her mounting disbelief as Trump began to win primary contests in 2016 for the Republican presidential nomination. Former castmates whom she had not heard from in years, but who had heard her story about sleeping with Trump in 2006, would call her up to marvel at the news. But as Trump kept winning, she writes, the story she had to tell about Trump seemed more sensitive the more he won. Daniels’ relationship with Trump included one moment in 2007, she writes, in which she is with Trump in a hotel room watching a Shark Week broadcast on cable television when he receives a phone call from Hillary Clinton, then running against Barack Obama for the Democratic presidential nomination. The friendship, on both sides, was a transaction (as are all of Donald Trump’s relationships). Not personal, as they say in the “The Godfather” — just business. Perhaps the collision of Donald Trump and the Clintons on the biggest stage of all was inevitable. But was it orchestrated? At the restaurant in Trump Tower last summer, I asked the mogul about the “Manchurian Candidate” buzz, about that phone call he got from Bill Clinton in May 2015, when the businessman and reality star was making up his mind whether to run. The Washington Post quoted four Trump allies and one Clinton associate as saying that Clinton encouraged Trump’s efforts to play a larger role in the Republican Party. Roger Stone, author of “The Clintons’ War on Women” and a longtime confidant of Trump’s, claims that Bill urged Trump to get in the race and told him he thought he could get the nomination. “That’s why the people with the tinfoil hats are convinced the whole thing is a setup,” Stone says. “Bill can’t help himself from giving advice. He loves the game. He’s the great kibitzer.” Stone said Trump also asked Bill three years ago if anyone could be elected president as an independent, and Bill told him no. I tried to get to the bottom of this murky story that day at Trump Tower, but when you’re dealing with Bill and Donald and truth, it’s an elusive goal. “Did Bill tell you that you should run?” I asked. “He didn’t say one way or the other,” Trump replied, over a plate of meatballs. The afternoon of November 8, 2016, Kellyanne Conway settled into her glass office at Trump Tower. Right up until the last weeks of the race, the campaign headquarters had remained a listless place. All that seemed to distinguish it from a corporate back office were a few posters with right-wing slogans. Conway, the campaign’s manager, was in a remarkably buoyant mood, considering she was about to experience a resounding, if not cataclysmic, defeat. Donald Trump would lose the election — of this she was sure — but he would quite possibly hold the defeat to under six points. That was a substantial victory. As for the looming defeat itself, she shrugged it off: It was Reince Priebus’ fault, not hers. Most presidential candidates spend their entire careers, if not their lives from adolescence, preparing for the role. They rise up the ladder of elected offices, perfect a public face, and prepare themselves to win and to govern. The Trump calculation, quite a conscious one, was different. The candidate and his top lieutenants believed they could get all the benefits of almost becoming president without having to change their behavior or their worldview one whit. Almost everybody on the Trump team came with the kind of messy conflicts bound to bite a president once he was in office. Michael Flynn, the retired general who served as Trump’s opening act at campaign rallies, had been told by his friends that it had not been a good idea to take $45,000 from the Russians for a speech. “Well, it would only be a problem if we won,” ­Flynn assured them.